In Part 1, we learned a few tips from Weaver Leather’s President Paul Weaver on choosing the right leather. From looking at stretch tolerances to considering the techniques you want to use on your project, Part 1 offered a great overview. Now we will continue with a few more points that you will want to keep in mind. What cut of leather is best suited for your project? The total size of your project along with the total number of individual pieces you are making will determine the cut of leather you should use. For example, I recommend sides for products with smaller straps including 12″ x 12″ patterns and items that need extra length. Backs and bends are perfect for products that require the best cut of leather and the least amount of stretch. How much leather do I need to complete this project? To ensure all your leather has the same weight and finish, be sure to order an adequate quantity of leather including your waste factor. Planning ahead and placing an order for all the leather you’ll need for your project at the same time will save you time and frustration in the long run. There’s nothing more annoying than getting halfway through a project and running out of materials. 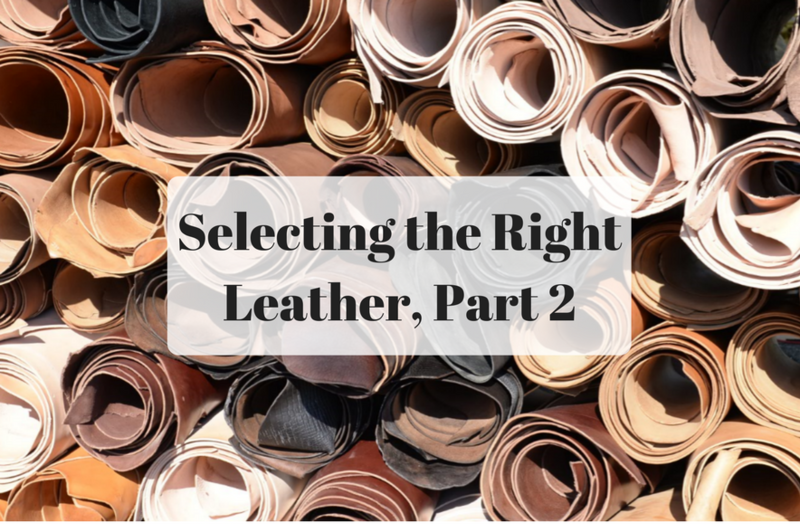 By asking yourself the questions in Part 1 and Part 2 of this series, you’ll be well on your way to choosing the right leather for your project every time.